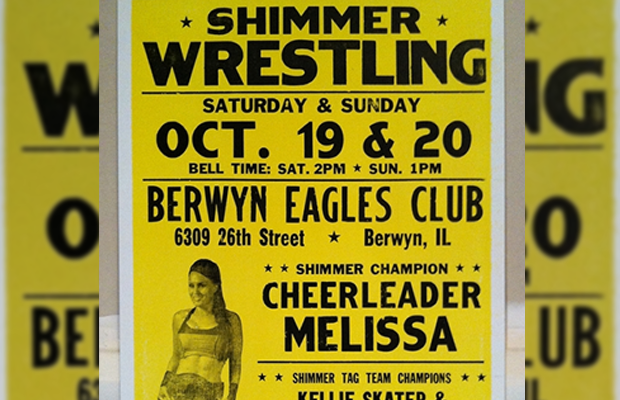 This weekend SHIMMER returns to the Berwyn Eagles Club in Berwyn, Illinois to film the next set of its DVD series. Volume 58 results below, courtesy of Jennifer. * JK Kennedy (formerly Jessie Kaye) def. Midianne via a second rope flatliner. * Angie Skye def. “Crazy” Mary Dobson via the Unprettier. * Portia Perez def. ThunderKitty after slamming her head into an exposed turnbuckle. * Santana Garrett def. Sassy Stephie w/ Mademoiselle Rachelle via a Shining Star Press. Post-match, Santana attacks Rachelle, prompting Nevaeh to interfere, who is run off by the debuting Savannah Summers. * Jessicka Havok def. Mary Lee Rose via a chokeslam. * Nikki Storm def. Su Yung via the Eye of the Storm in her SHIMMER debut. * Mercedes Martinez def. Veda Scott via the fisherman buster. * Backstage interview with Madison Eagles. She says she hasn’t lost a match since losing her title and issues an open challenge. * Hikaru Shida def. Mia Yim via a running Yakuza kick. * Cherry Bomb and Kimber Lee def. Christina Von Eerie and MsChif with a Codebreaker/release German suplex combination on Von Eerie. * Dan Murphy of PWI and Amber Gertner are in the ring. It is announced that over 20 members of the SHIMMER roster are in the PWI Female 50 this year and SHIMMER Champion Cheerleader Melissa has ranked #1. She’s presented a plaque in the ring. Melissa trashes the locker room, including Allison Danger and Leva Bates. Leva comes out to the ring and we have a impromptu match! * Cheerleader Melissa def. Leva Bates via Air Raid Crash to retain the SHIMMER Championship. Post-match, Melissa hits two more Air Raid Crashes and Allison Danger makes the save. Melissa attacks Danger and LuFisto makes the save. * Hiroyo Matsumoto def. Saraya Knight. * Nicole Matthews vs. Madison Eagles ends in a 20 minute time limit draw. * Main Event: SHIMMER Tag Team Champions Global Green Gangsters (Kellie Skater and Tomoka Nakagawa) def. LuFisto and Kana to retain the SHIMMER Tag Team Championships after a double kick to LuFisto.